The only PGA Tour event hosted at a Par-3 course tees off today, with the team of Jack Nicklaus and Gary Player headlining the field and competing on a course designed by the Golden Bear. 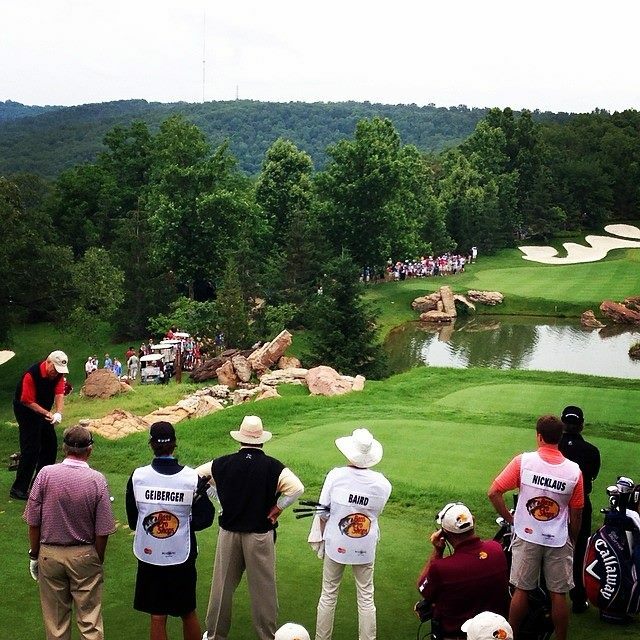 Held this week at Big Cedar Lodge, the Bass Pro Shops Legends of Golf event is played at Top of the Rock, a Jack Nicklaus Signature Golf Course, and Buffalo Ridge, a Tom Fazio layout. The tournament will be broadcast today on the Golf Channel from noon to 2:30 p.m. ET, and Saturday and Sunday from 3:00 p.m. to 6:00 p.m. ET. Buffalo Ridge will host the first two days, while the final round will be held on the Top of the Rock Course. The 9-hole Top of the Rock course will be played twice to total 18 holes. The event is an opportunity to be in the company of more World Golf Hall of Fame members than at any other time in history, with a field featuring the Golden Bear and other legends of the game, such as Tom Watson, Gary Player, Colin Montgomerie, Ben Crenshaw, and 2016 Ryder Cup Captain Davis Love III. There will be two divisions of play—Champions and Legends. The Legends division will be players who are 65 years and older. Nicklaus, the only player in history to have completed the career Grand Slam on both the regular and senior tours, tees off at noon ET today in the Legends division. His group will include Player, and the team of Lee Trevino and Mike Hill. Nicklaus and Player open today on Top of the Rock, playing nine holes of better ball and nine holes of modified alternate shot. In modified alternate shot, both players hit a tee shot, then pick the best ball and play alternate shot from there. Between them, they have collected 101 PGA Tour victories and 29 Champions Tour wins. Nicklaus’ eight majors on the senior circuit remains a record. Saturday, the Nicklaus-Player team tees off at 12:48 p.m. ET. Participants can also rub elbows with many other high-profile celebrities and legends in fishing, racing, and entertainment. Add to that the opportunity to enjoy time in the heart of the Ozarks on spectacular golf courses. The natural Ozarks topography adds a unique twist to Top of the Rock, while the magnificent views of Table Rock Lake make it unlike any other. Golf Advisor named the course on its 2015 list of the Best 10 Par-3 Golf Courses in the U.S., and its list of the Top 10 Jack Nicklaus-designed Golf Courses You Can Play in the U.S. in 2014. Corey Pavin played Top of the Rock in Tuesday’s practice round under especially windy conditions. “If it’s windy like this, it’s extremely challenging,” Pavin said. “And it’s challenging enough when it’s not windy. Even in ideal conditions, Pavin said the Top of the Rock layout has some teeth in it. This tournament is the second-oldest Champions event behind the Senior PGA Championship. The Legends started in 1978, two years before the Champions Tour formally came into being. For more information on this week’s Bass Pro Shops Legends at Big Cedar Lodge, visit bassprolegends.com.